Western blot analysis of extracts from various cell lines using Tri-Methyl-Histone H3 (Lys36) (D5A7) XP® Rabbit mAb. 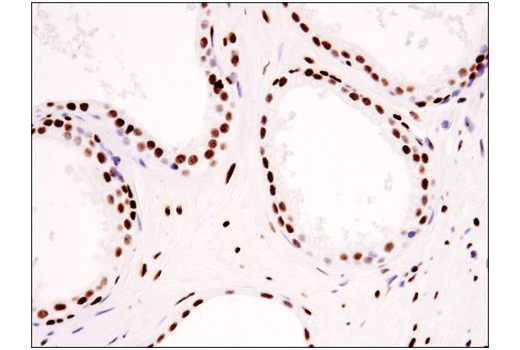 Immunohistochemical analysis of paraffin-embedded human papillary carcinoma of the breast using Tri-Methyl-Histone H3(K36) (D5A7) XP(R) Rabbit mAb. 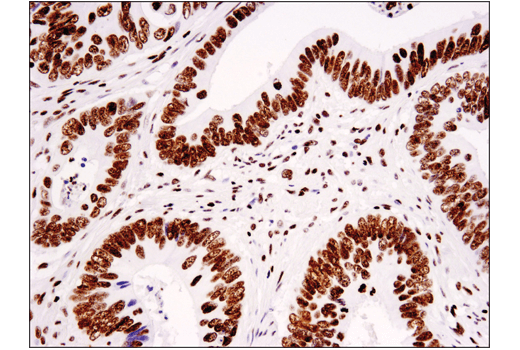 Immunohistochemical analysis of paraffin-embedded human colon carcinoma using Tri-Methyl-Histone H3(K36) (D5A7) XP(R) Rabbit mAb. 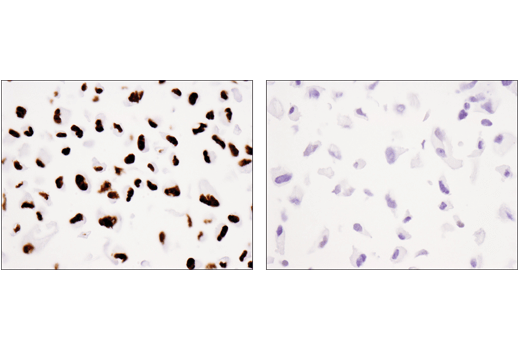 Immunohistochemical analysis of paraffin-embedded 786-O cell pellet (left, positive) or A498 cell pellet (right, negative) using Tri-Methyl-Histone H3(K36) (D5A7) XP(R) Rabbit mAb. Note that the A498 cell line harbors a SETD2 mutation. 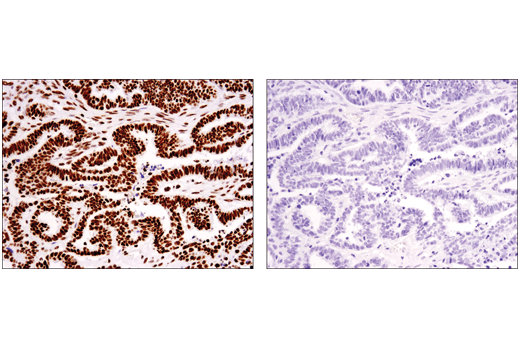 Immunohistochemical analysis of paraffin-embedded human serous papillary carcinoma of the ovary using Tri-Methyl-Histone H3(K36) (D5A7) XP(R) Rabbit mAb in the presence of non-methyl peptide (left) or K36 tri-methyl peptide (right). 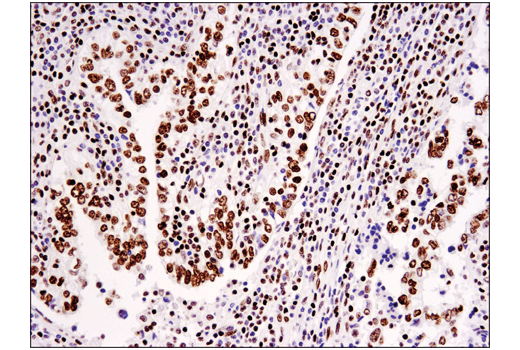 Immunohistochemical analysis of paraffin-embedded human prostate carcinoma using Tri-Methyl-Histone H3(K36) (D5A7) XP(R) Rabbit mAb. 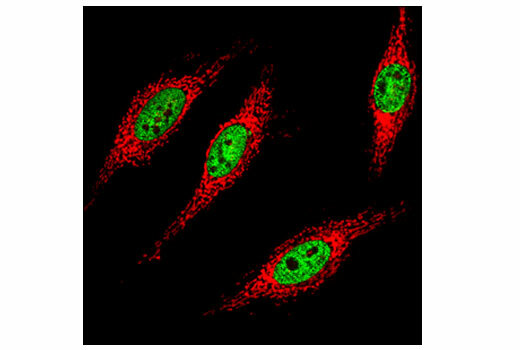 Confocal immunofluorescent analysis of HeLa cells using Tri-Methyl-Histone H3 (Lys36) (D5A7) XP® Rabbit mAb (green) and COX IV (4D11-B3-E8) Mouse mAb #11967 (red). 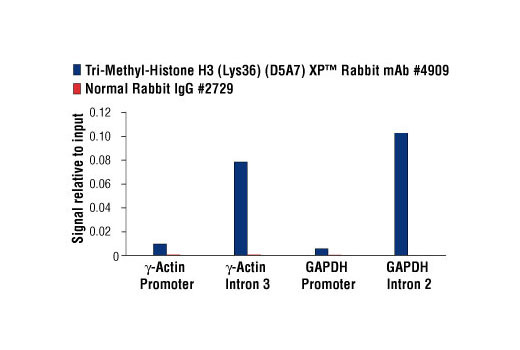 Flow cytometric analysis of HeLa cells using Tri-Methyl-Histone H3 (Lys36) (D5A7) XP® Rabbit mAb (blue) compared to concentration-matched Rabbit (DA1E) mAb IgG XP® Isotype Control #3900 (red). Anti-rabbit IgG (H+L), F(ab')2 Fragment (Alexa Fluor® 488 Conjugate) #4412 was used as a secondary antibody. Chromatin immunoprecipitations were performed with cross-linked chromatin from HeLa cells and either Tri-Methyl-Histone H3 (Lys36) (D5A7) XP® Rabbit mAb or Normal Rabbit IgG #2729 using SimpleChIP® Enzymatic Chromatin IP Kit (Magnetic Beads) #9003. The enriched DNA was quantified by real-time PCR using SimpleChIP® Human γ-Actin Promoter Primers #5037, SimpleChIP® Human γ-Actin Intron 3 Primers #5047, SimpleChIP® Human GAPDH Promoter Primers #4471, and SimpleChIP® Human GAPDH Intron 2 Primers #4478. The amount of immunoprecipitated DNA in each sample is represented as signal relative to the total amount of input chromatin, which is equivalent to one. 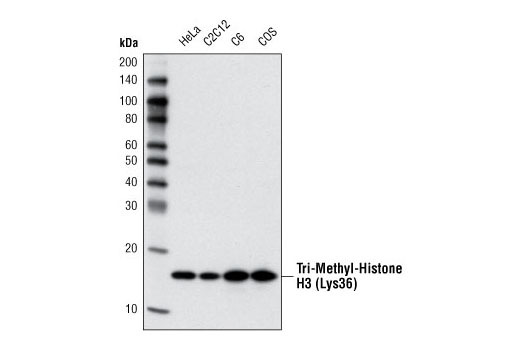 Tri-Methyl Histone H3 (Lys36) (D5A7) XP® Rabbit mAb specificity was determined by peptide ELISA. The graph depicts the binding of the antibody to pre-coated tri-methyl histone H3 (Lys36) peptide in the presence of increasing concentrations of various competitor peptides. As shown, only the tri-methyl histone H3 (Lys36) peptide competed away binding of the antibody. 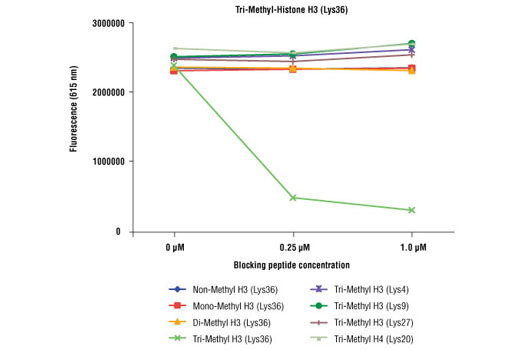 Tri-Methyl-Histone H3 (Lys36) (D5A7) XP® Rabbit mAb detects endogenous levels of histone H3 only when tri-methylated on Lys36. The antibody does not cross-react with non-methylated, mono-methylated, or di-methylated Lys36. In addition, the antibody does not cross-react with histone H3 methylated at Lys4, Lys9, Lys27 or histone H4 methylated at Lys20. Monoclonal antibody is produced by immunizing animals with a synthetic peptide corresponding to the amino terminus of histone H3 in which Lys36 is tri-methylated.